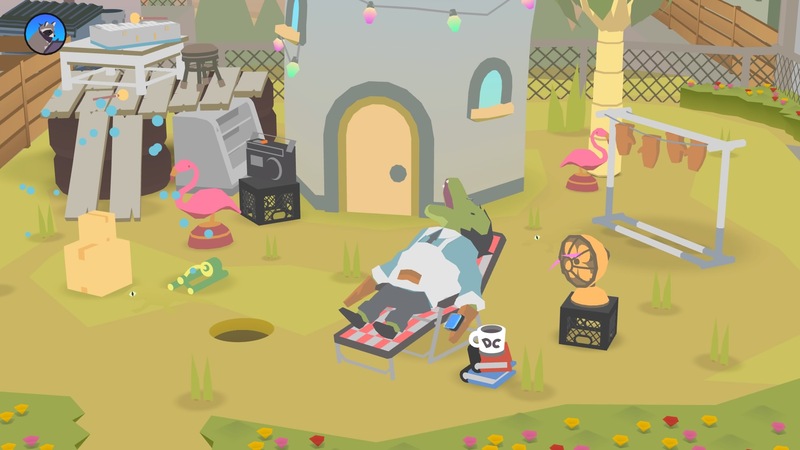 Donut County is a game about holes and doughnuts, and occasionally doughnut holes. But that’s not the whole (sorry) story. You will encounter many holes, doughnut or otherwise, most of your own making and use them to steal people’s trash from around town and run rings (sorry) around its inhabitants. As a mechanic it’s not a hard one to swallow (sorry) — this is very much a game you won’t want to a-void (sorry). Okay stopping now, no more puns. You play as BK, a trash panda (or racoon, to those not brought up on the internet) who works in a doughnut shop with his friend Mira. BK is also trying to get enough points on his new app to buy a quadcopter, and in a totally unrelated sequence of events, giant holes have appeared all over Donut County dropping its residents into a giant chasm and trapping them 999 feet below the surface. Oh and they all just so happened to have ordered a doughnut from BK right before, but that’s just a coincidence, right? The game then plays out in little vignettes, the story told through a series of campfire tales from underground and flashbacks to show how each person arrived there, with the occasional interjection between BK and Mira. It’s all very charming, very amusing and ‘much lols’. And you will hear “lol” a lot, the characters throw them around with abandon and ‘internet speak’ is de rigueur. If you’ve paid more than a passing glance to Reddit or Twitter or identify as a ‘millennial’ you’ll no doubt be laughing out loud or at least smiling to yourself along the way (who actually laughs out loud anyway?). 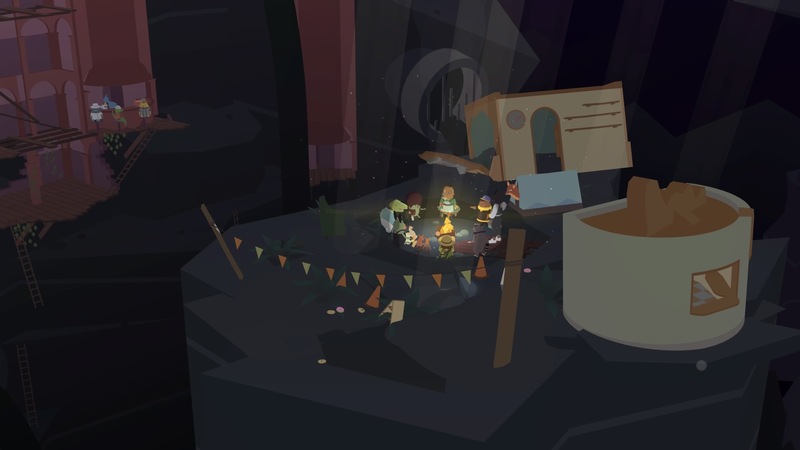 ‍Donut County’s vibe is the muted tones of the desert remixed with LA’s sunset neon aesthetic. Each flashback, or ‘level’ if you will, sees you starting as a small hole, controlled by BK on his phone, which you move around the scene consuming trash as you go. What that trash is composed of varies from location to location, be it a pottery studio, a desert full of snakes or even a restaurant complete with roving cockroaches and a bird that will only drink a perfectly seasoned soup. At the beginning of each scene you’ll only be able to swallow small rocks and objects but your hole soon grows into a gaping void that can consume buildings, cars and even the very landscape itself. The mechanics are curiously similar to those old Flash games where you played as a fish, eating slightly smaller fish, growing in size while avoiding the bigger ones. This is the exact same, except that you’re a hole eating trash and with all the danger removed. Some objects need a bit of wangling and angling to fall down the hole, and certain objects need to be consumed to unlock others, but they all end up on the trash pile eventually. ‍A ‘trashpedia’ lets you review everything you’ve swallowed, with ‘informative’ descriptions. The difficulty grows infinitesimally with the addition of elements such as fire and water and eventually a catapult, requiring certain combinations of ‘swallowing’ and firing to cause the chaos you desire. Water, for instance, will fill up your hole preventing you from swallowing anything else until it is cleared. Some of the game’s most joyful moments spring from these causes and effects. Fire is used to light fireworks and transforms burnable objects into more useful items. In one memorable scene, after swallowing two bunnies, there is a predictable but no less amusing result which offers up one of the game’s many moments of unfiltered joy. ‍More complex puzzles have you dredging rivers of water through the use of drinking birds, but sadly it doesn’t get much more complex than this. It’s a shame then that this puzzle aspect and sequencing of elemental states isn’t explored further. It’s only really in the final level, an infiltration of the shady corporation behind BK’s trash collecting app, run by the aptly named Trash King, that requires any thought, timing and careful management of the hole’s different elemental states. It all wraps up with a rather underwhelming boss fight that’s mostly there for the sake of the story and a final lesson on the importance of friendship and working together, which, thanks to the relationship and ‘bants’ of BK and Mira manages to land without being overly saccharine. There’s so much potential here for complexity and deeper puzzle mechanics that you feel slightly cheated that they weren’t brought in sooner. 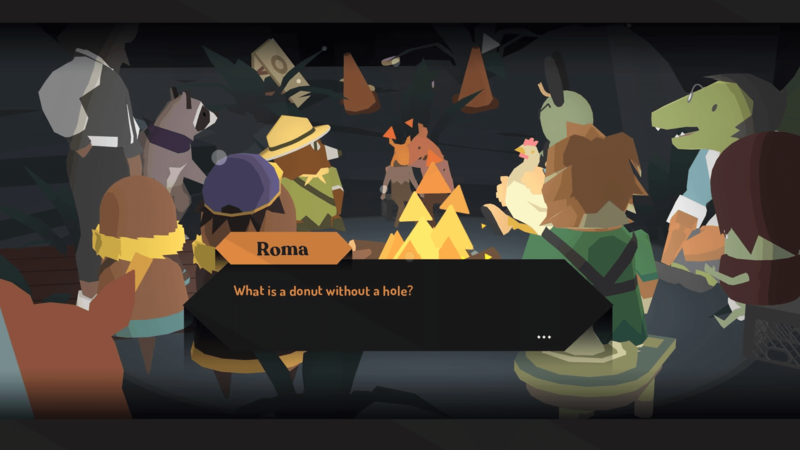 But then Donut County was developed solely by indie creator Ben Esposito and published by Annapurna Interactive (Florence, Gorogoa), well known for making accessible, narrative-driven games. The focus here is on ensuring everyone has the chance to play the full game and have a good time, rather than get stuck and give up. And for a single creator, it’s an impressive achievement. ‍BK and the rest of Donut County spend most of the story trying to escape the hole they find themselves in. 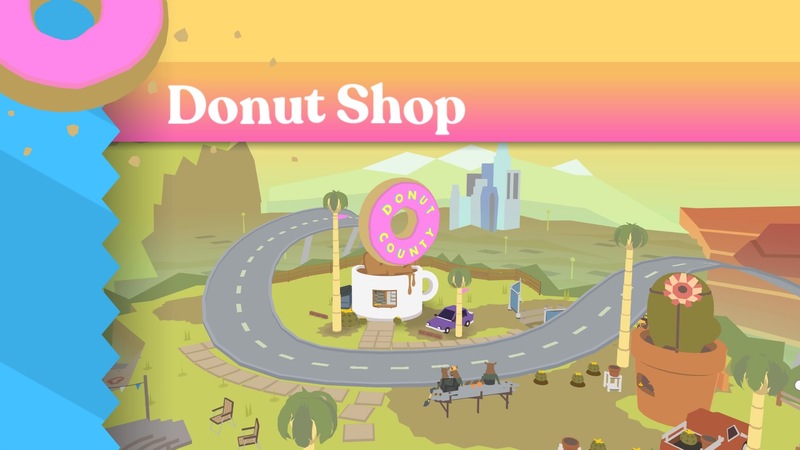 So is Donut County a wry comment on our consumerist, materialist capitalist society? Is Trash King a metaphor for Amazon, Google and Apple? Is it a prescient warning on the malignant forces which drive us to accumulate wealth and belongings at the expense of others? Or is it a post-post-modern comment on the danger of viewing life through our TV and phone screens, the risk in seeing everything as Jean Baudrillard theorised as a simulacra, everything a sign that reflects only itself, without origin, far removed from reality, so that we can no longer understand or comprehend the consequences that our actions online have in our physical ‘real’ world? I mean, maybe? But c’mon, no-one should have to reference Baudrillard in a game review. This is a game that clearly holds and swallows (sorry) meaning, Ben Esposito wrote in an interview with Gamasutra that, “A game has got meaning whether u like it or not!!!! 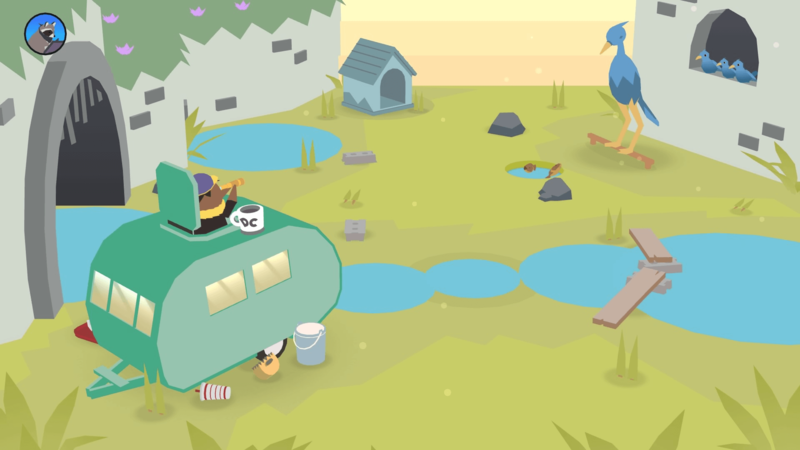 If the work seems apolitical that just means the underlying structures are invisible to you… U should be very scared.” But the ironic twist of Donut County is that it is perhaps best enjoyed at its surface level — as joyful, simple fun. There is something deeply (sorry) satisfying about starting as a small hole in a little mise en scène and then slowly growing, sucking up ever bigger and more ridiculous objects. Nothing here is challenging but it is often delightful and always immensely charming. And maybe that’s okay, in a world of crushing anxiety, maybe it’s okay to play a game for three hours and see it as straightforward, silly fun. You could go looking for faults (it’s obviously a game that got its mechanics first and story second, it doesn’t make full use of its own concept) but why bother? Because actually, it all works, the gameplay, story, and colourful cast of characters do unify into an extremely playable, enjoyable and meaningful (if you want it) experience. In these dark worrying times, internet humour and comic irreverence are so often how we choose to push back against the void and find some joy in the world. 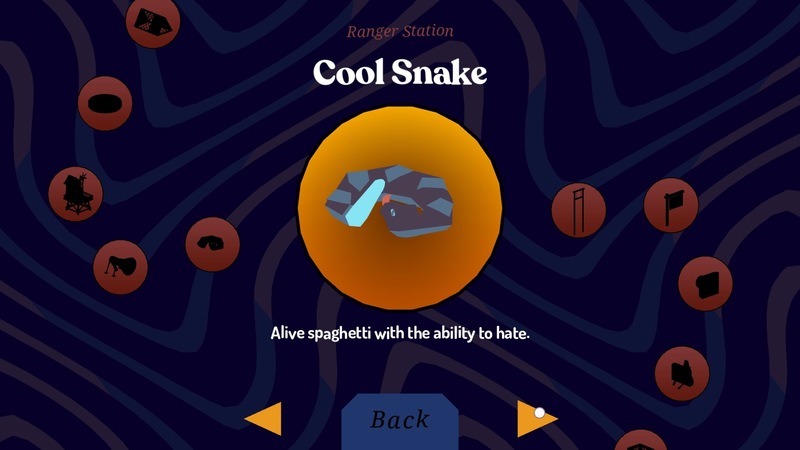 And Donut County is exactly the kind of game to help you do just that. Lol.